Welcome to ArtLery! Your place to shop for custom made wedding gifts, engagement gifts, anniversary, house warming and more! 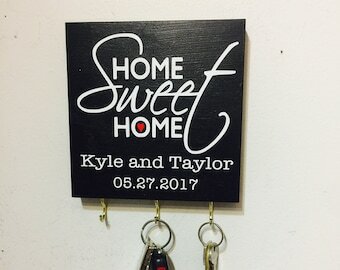 There is no better, unique and thoughtful gift than a custom made sign! Sure to last for a lifetime! *You can now purchase with Direct Checkout! It is now available on my store! No need to have a paypal account, just go ahead and pay directly- it's that easy! Wedding Gift - Family Tree Personalized Custom Wedding Love Birds Tree Branch - 8x11- Black and Gold. Engagement Gift. Couples Gift. Decorative Scroll Design Personalized Last Name Sign with Established Year. Personalized Wedding Gift, Engagement Gift, Anniversary. Personalized Love birds Sign/Key Holder in Gold/Silver. Great Gift Idea for Wedding, Engagement Gift. Personalized Wedding Gift for Couples. Black & Silver Personalized Monogram Key Holder. Perfect for wedding gift, anniversary gift, engagement gift and bridal shower gift. The communication with the seller is really good and the quality of the products is amazing, totally recommend this seller! I would totally order again for future gifts. Thanks again! I ordered it as a gift, and my cousin loved it! Great communication too! I hope that you find something in my shop that you will love! I love creating things that I can decorate our house with, so I am sharing these creations with you. Please come check my shop regularly for new items. If you have any questions about policies, the link is on the left side. *You can either contact me through ETSY CONVO (contact seller ) or at joy [!at] artlery.com. I will try my best to respond to your message within the same day. All items come wrapped in pretty tissue inside a handmade box, safely shipped inside a sturdy USPS box. I apologize, since these are custom orders, I do not offer refunds. Personalized orders can take up to 1 week to make before they ship depending on how many orders I have ahead of yours. Please let me know if you need something by a certain date BEFORE you purchase and I will do my best to accommodate your needs. It's best if we work out those details BEFORE you purchase so you are not disappointed. Thank You for your understanding. For US orders, I use USPS Priority Mail, so you will receive your order in just 2-3 days. I will email you the tracking # as soon as I ship your order. Your order will be shipped on a small USPS box so the product will be safe and secured and won't be damaged. **is subject to custom fee if buyer is not available when attempted delivery is made). Sorry about this, it is the country's law on importing goods.